INT. WELLHOUSE – NIGHT ABIGAIL, 19. Rushes in and SLAMS the door. As if trying to keep Satan himself out. She clutches her BABY to her breast. Kneels by DYING EMBERS in the hearth. She blows on ‘em but a flame never catches. Her Baby starts to fuss… ABIGAIL Hush now, shhhh… it’ll be — She stops. Realizes that the SMALL CANDLE CHANDELIER slowly spins above her. As if some unnatural force has caused its light to rotate around the room, like tiny primitive searchlights. She hears something slithering in the gray shadows by the Well. Occasionally we catch glimpses of a BLACK SILHOUETTE. Shifting its shape. As if trying to decide on a form. ABIGAIL (CONT’D) Please, Devil… leave us be… Shape shifts again. 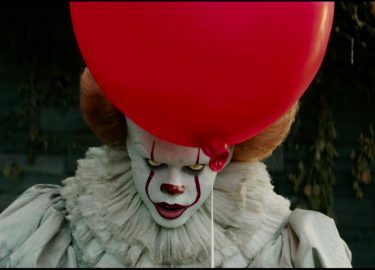 A beam of light passes, revealing PENNYWISE, naked, lithe, flesh pale and translucent, a half- formed imitation of a human, opens his maw full of large razor sharp teeth, dripping with saliva. As the Tin Can spins clockwise, Pennywise moves counter around the room. Each time the light hits his face — It’s different. A Man. A Woman. A Beast. A Monster. PENNYWISE So you say. The Baby SCREAMS. Pennywise smiles. PENNYWISE (CONT’D) Beautiful fear… ABIGAIL I pray Thee, take me. Abigail shuffles back. PENNYWISE I will. And then, him. And thy husband and the rest of thy children, and all the savages who brought you here. And when you all rot in the earth, I will pick thy bones dry until no meat is left to pick. And then I will seek out thy bones and consume thy souls until nothing is left but the weeds! (beat) Or you will occupy yourself otherwise and not interfere. I will take her and you will live, and those of thy other children — in whom I take no interest. And you will thank ME fever and frost did not damn you to the soil. Abigail looks down at her baby again.